The Reunion giant tortoise (Cylindraspis indica) is an extinct species of tortoise in the family Testudinidae. It was endemic to Réunion Island in the Indian Ocean. This tortoise was numerous in the 17th and early 18th centuries. They were killed in vast numbers by European sailors, and finally became extinct in the 1840s. The Réunion giant tortoise was 50 to 110 cm long. It was the largest of the Cylindraspis giant tortoise species of the Mascarenes. It was roughly the same size as modern Aldabra and Galapagos tortoises, though it was a longer and more elongated animal. It had long legs and a long neck which supported a large head with powerful, strongly-serrated jaws. The species was sexually dimorphic, in that males were noticeably larger than females. It was also a highly variable species. A problem arises when identifying this species because it appears there were domed variants as well as saddle-backed variants. This species was endemic to Réunion. On this island it was naturally extremely numerous, and its vast herds provided an important role in the health and rejuvenation of the indigenous forests. These giant tortoises were very slow, curious, and had no fear of humans. They were therefore easy prey for the first inhabitants of the island, and were slaughtered in vast numbers to be burnt for oil, as food for people, and also as food for pigs. Large numbers were also stacked into the holds of passing ships, as food supplies for sea trips. 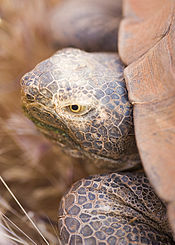 In addition, invasive introduced species, such as pigs and rats, destroyed the eggs and hatchlings of the tortoises. Coastal populations were completely decimated by the 18th century. It was presumed extinct in much of the island since 1800 with the last specimen observed in upper Cilaos. The last few animals survived in the highlands until the 1840s. Wikimedia Commons has media related to Cylindraspis indica. ^ Fritz Uwe; Peter Havaš (2007). "Checklist of Chelonians of the World" (PDF). Vertebrate Zoology. 57 (2): 277. ISSN 1864-5755. Archived from the original (PDF) on 17 December 2010. Retrieved 29 May 2012. ^ "IUCN redlist". Retrieved 12 June 2015. ^ Cheke AS, Bour R: Unequal struggle—how humans displaced the tortoise's dominant place in island ecosystems. In: Gerlach J, ed. Western Indian Ocean Tortoises: biodiversity. 2014. ^ W. Rotschild: . On the gigantic land tortoises of the Seychelles and Aldabra-Madagascar group with some notes on certain forms of the Mascarene group. 1915. Novitates Zoologicae 22. ^ J. Gerlach: Giant tortoises of the Indian Ocean. The genus Dipsochelys inhabiting the Seychelles Islands and the extinct giants of Madagascar and the Mascarenes. Edition Chimaira, Frankfurt. 2004. ^ D.Day: The Doomsday Book of Animals. Ebury Press, London. 1981. ISBN 0852231830. World Conservation Monitoring Centre 1996. Cylindraspis indica. 2006 IUCN Red List of Threatened Species. Downloaded on 29 July 2007.